So when the opportunity presented itself to play the gorgeous Mellon Auditorium for the Washington Performing Arts 50th Anniversary Gala, we knew it was a no-brainer: D.C. OR BUST! Even better, the event was held to honor the incredible Reggie VL and to raise funds for the Washington Performing Arts—needed now more than ever, what with potential cuts being discussed to our nation’s vital arts funding. It was a great show with many DC and Hollywood elites in attendance, including the honorable Ruth Bader Ginsburg, the venerable Cicely Tyson (both NY natives by the way! ), and D.C. native and international Soprano, Alyson Cambridge, and The Children of the Gospel Choir. 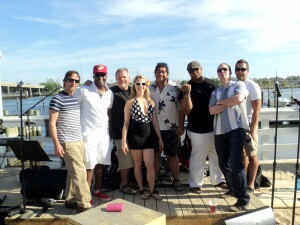 It was a great time and the band was happy to be back in DC again. When Justice Ginsburg was sworn into office by President Bill Clinton, guess which band was chosen to perform for her celebration back in 1993? Yes, we have been around for over 30 years and we’re still going strong. Check out some more pics from the event below. For booking or inquiries, click the link. East Coast Music & Entertainment has a stellar reputation for providing top tier entertainment at fair prices in New York City, Long Island, the Tri-State Area and all along the East Coast. We feel blessed to be in a business where smiling faces (and tired feet) are the company goal! For upcoming public shows, check out our schedule page. East Coast Band, a Live Entertainment Band, servicing Long Island and New York City is happy to provide you with quick tips on hiring a wedding band. When you are looking to hire a band for your wedding you may realize that this is the first time you’ve ever hired a band in your life. 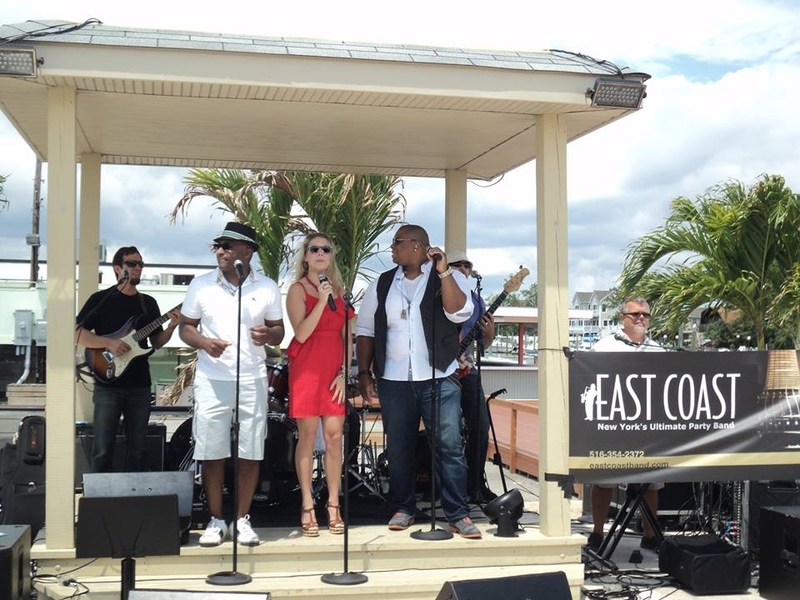 East Coast is a live band that is versatile and will keep the dance floor packed all night and it will truly be an event to remember. Ask the band as many questions as you need to, we encourage you to ask questions and speak your mind! This is your event and we’re sure that you have a good picture in your mind of how you would like things to go. With your ideas and our talent and experience, you can be sure that yours will be an event to remember! It’s important to check out their experience, wedding events call for professional live entertainment. Although your friends brothers cousin is great on the drums, when it comes to your special day, you want a wedding band that is seasoned and well rounded. Always check to make sure the band has a song list, also verify they can learn new songs if necessary. Make sure the band is familiar with playing the important traditional wedding songs. These songs include the father daughter dance and of course the bride and grooms first dance. When hiring a live wedding band, its important to give adequate time for them to learn specific songs. When you are looking for the right band for your event, remember that when comparison shopping, the price we quote you is the price you will pay. Unless we specify otherwise, all production costs, insurance, crew and standard lighting cots are included. East Coast Band always dressed formally unless we are instructed to dress in another way. When the band takes breaks, is usually a concern, we are sure that with proper communication between us and our client we make sure the party retains momentum and there are no situations where the guests are idly waiting for something to happen. New York has always stood apart from the rest of the country in the way we intermingle food service, music and “festivities” to create the illusion of non-stop dancing (and fun) from beginning to end. This time-tested model has recently come under attack. Until the past few years, maitre d’s could be expected to control the “day of” flow with a firm hand and communicate instructions to all the vendors (band, photo, video) in a timely manner. Increasingly we are being approached by clients regarding the “flow” of an event when their questions to their caterers are being deflected with “we will do whatever you want” or “ask the band.” A band that is on stage singing and performing is in no position to monitor the timing of food coming out of the kitchen or keep tabs on a photographer who has the couple or key family members outdoors for extra pictures. Back in the day maitre d’s were compensated extremely well for exactly these duties and we’re not quite sure why so many are MIA. In conversation, a few complain that they have been so barraged by clients with “great ideas they found on the internet” or photographers so anxious to get all their work done in the first 45 minutes of the event that they just “shut down” and become laissez faire. The pattern has been striking and undeniable. We therefore feel the need to share our long experience and perspective. Below is a tried and true timeline and formula that guarantees that guests remain involved from start to finish.. Multiple dance sets not to exceed 90 minutes. Most wedding guests can dance but for so long without a break, therefore it never makes sense to front load all food, toasts and formalities to the first 45 minutes leaving 3:15 of uninterrupted time on the back end. We’ve heard this formula suggested by photographers and planners. It all sounds great until one stops to consider that no matter how good the band is, people will seek a breather and if there are options outdoors or outside the main ballroom (especially if there is a bar! ), parties can lose momentum. Such timelines run the risk of guests leaving early or drifting off into cliques. If you are OK with such a scenario, we still think it prudent to have a sure fire plan to draw them back in. Leaving parent dances or even a “thanks’ for coming” speech by the bride and groom until well AFTER entree can be a useful tool and safety net. 8:30-8:50 Entree (vendors served early and resume their duties; dead last is a “party” killer). 9:30-9:40 Parent dances (bouquet/garter if applicable). Dessert and coffee served. 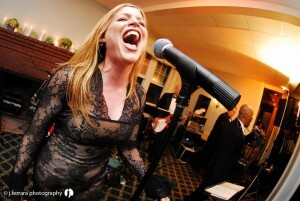 One of the most important factors that will lead to a successful party or wedding is hiring the right band. A great, experienced wedding band will make your party; inexperience always has the potential to break it. Clients often over value youthful image, failing to realize that the success of a dance party has more to do with the “reading the dance floor”, a sensible timeline (that maintains party momentum) and the interactions with the caterer and other vendors. Hipster bands made exclusively of “twenty somethings” may appeal and sound great doing a prepared set at a concert venue with “house” sound but does that translate to the real world of weddings were acoustics are imperfect and decisions must often be made on the fly. Remember that the band also must interact with your photographer and other vendors so that all remain on the same page. Doing that while trying to sing and play at the same time comes with practice! East Coast has long been renowned as New York’s most versatile band. No matter the venue or event, we can rock the house with out youthful energy and create fun party experience that your guests will remember for years. Choosing the entertainment for your event really is on of the most important decisions that you will have to make during the planning phases of your wedding. The decision to hire a band for your big day often leads to the daunting realization that you have never hired a band in your life and you may not know exactly what to do. When you work with East Coast you can be ensured a thoroughly stress free experience. We are there from the very first moment to personally assist you with every phase of your entertainment planning. When planning a wedding, you have enough things to worry about, now music doesn’t have to be one of them! Get your successful party started today and book East Coast for your wedding! We play music that will make each affair unique and memorable, and include great songs that are not your typical wedding band fare. We love to entertain. A quick look at our song list, we show we play a wide variety of genres. 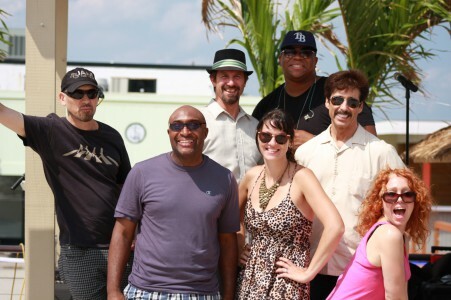 We pride ourselves in not being easily categorized and playing stylistically and with musical integrity. Too many NY weddings bands think it hip to throw everything into their “groove” hopper: in our book, classic or alternative rock is not supposed to sound like James Brown nor vice a versa. Likewise with all the other genres. You can look at our song list to highlight songs that you want to hear or point at songs that you do not want to hear on your big day. 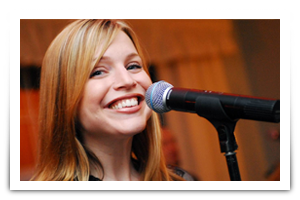 We can also learn a number of songs to help personalize your big event. With proper notice (at least 30 days) we will learn the materials and perform it for you. At East Coast we understand that planning a wedding is very time consuming and can be very expensive. Our goal is to help keeps costs down as well as reducing stress that you may experience while planning your wedding. When you hire us you can be sure that the entertainment planning will be a stress-free experience. We encourage you to ask questions and to speak your mind in the planning phase. This will help your wedding live up to your expectations, as we know that you have a good picture in your mind on how you would like things to go on the big day. Need to Book the Perfect Party Band? The party season is upon us and for us here at East Coast Band, this is one of our favorite times of the year. Now is the time of the year when (hopefully) your social card is full with everything from office holiday parties to corporate end-of-year fundraisers to annual Christmas galas and don’t forget about those “ring in the New Year” celebrations—tis the season to relax, look forward, and party! But what makes a great party? We can’t stress it enough. A get together can have all of the great hors d’oeuvres, good conversation, and fine spirits, but nothing sets it off like great music. There is nothing like great hi-energy music to take a party from dullsville to party town. Although we love them, our specialty isn’t just weddings, we play gigs—club dates, smoky bars, outdoor concerts, you name it. As versatile as we are, East Coast Band is the perfect dance band to play your corporate party, birthday, anniversary, fundraiser, or holiday event. With a repertoire that includes Motown, Contemporary, Modern, Pop, Rock, R&B, Country, Reggae, Jazz/Swing Standards, 50s, 60s, 70s Disco/Funk, 80s, 90s, Indie, Hip Hop, and on and on and on, if you like, we can perform it. Chances are we already have performed it! Our well-known musicians and singers including American Idol finalist Big Mike Lynche, Broadway’s Henry Haid (Movin’ Out), Kool & the Gang’s Gordon Dukes, Fred Wadlington (Cameo) will perform, arrange, and/or do mash ups of your favorite songs to fit any and all unique situations. Take a look at just a small selection of music that we have listed on our website. 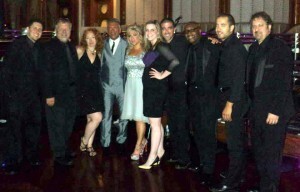 Whether it’s a hi energy band that you want for your dance party or you need some cool background music to accompany a fundraiser or end-of-year award ceremony East Coast Band is the premier New York and Long Island corporate event band for you. 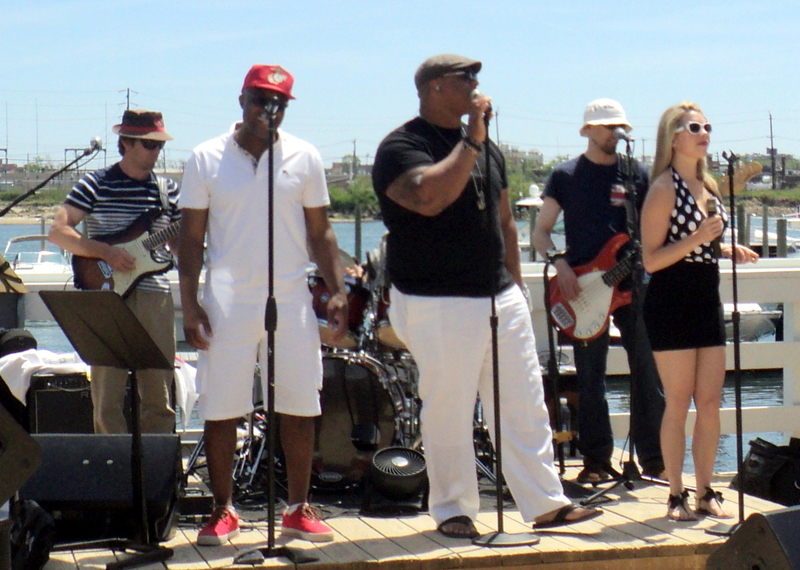 We play plenty of free public shows around NYC and Long Island several days a week. Come check us out. Last edition we discussed how New York style weddings are famous for the high energy way we blend food, music and, dancing. Remember it’s all in the timing, which gives the allusion of non-stop action even though we’re actually keeping a fine balance between calorie burning dance time and judiciously placed pauses that allow all to catch their breath. Today we address a pet peeve: the timeline trend from the caterer/wedding planner where four hours may pass before any serious dancing occurs! Or actually, several years ago in the wedding catering movement, caterers began to introduce the concept of 90 minute cocktail hours. This was a logical way to guarantee adequate time for guests to enjoy the ever increasing and often believable array of food presented. Our beef comes with those caterers/planners who insist that guests then be moved directly into 90 minutes of uninterrupted dinner service, punctuated only by a never ending parade of speeches. The salesperson/planner then suggests that guests are free to “party” for 2 1/2 hours straight! Yipee!!! The unfortunate reality is that after sitting for an hour at a ceremony, then three more drinking and eating, most people (especially the older folks) cannot be expected to do much more than fall asleep. Your guests are worn out just from sitting! Doing all the food at once may allow a caterer to make a very impressive spread and send staff home earlier, but it does not make for a great, hi-energy dance party. Insist that a common sense wedding reception plan is shared with your vendors, so that all are equipped to balance time for food, photos, music, and dancing. Trust us. 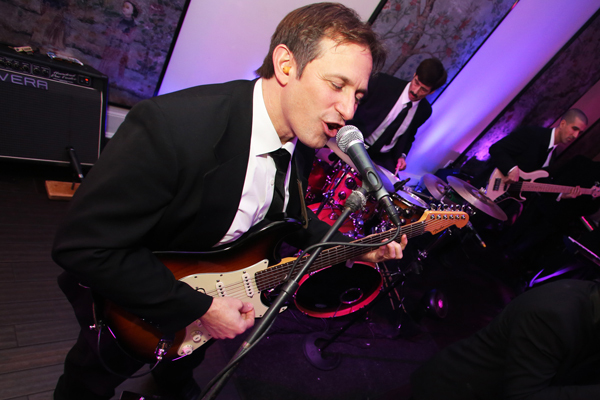 With multiple weekly performances and thousands of successful weddings all over NYC, Long Island, and the tri-state area in our resume, East Coast is the top wedding band and proven experts in combining client input in a way that keeps all your guests involved in non-stop dance floor action. Unlike other bands we do actually exist outside of lip synch karaoke tracks on a website and perform three to four nights a week. From your wedding ceremony to cocktail hour to wedding reception – we have done it all and would love to be a part of your special day. If you want your guests to remember your wedding, get this band!!! For more great East Coast wedding band reviews, head over to: Wedding Wire, LI Weddings.com and the Knot/Wedding Channel. Also, check our schedule and come hear us play. We can’t wait to meet you. Not to brag or anything, but East Coast Band has been known for turning around potential wedding fails by keeping the party going with our high energy music and commitment to making sure your dream day is pulled off without a hitch. Still…stuff happens. So how does one get over a wedding day fail? Some people say that your wedding day is supposed to be the happiest day of your life. It turns out, the “Big Day” falls short of expectations for many couples. New York style weddings are famous for their unique blend of great food, high energy wedding music and dancing that gives the illusion of five hours of non-stop action. Closer inspection reveals that there is a logical pacing and delicate ebb and flow, which are the result of experienced entertainers and catering staff working together to achieve the ultimate party. You’re in hour four of your wedding reception, the dance floor is packed, the energy is high, the band is in full swing, and then your host directs the party outside for the next “choreographed event”: Sparkler Lighting on the lawn. Was that really the best time? Did you need sparkler lighting? Would people come back afterwards ready to get back to partying or would they see it as the lull they needed to call it a night? In this first article in our series, Decisions that can Make or Break your Wedding, we suggest that if a New York styled high energy dance party is your goal, then putting your faith in experienced professionals while having a “less is more” strategy is our best advice! Today’s brides often feel pressured by well-meaning party planners, friends, or blogs to make their wedding personal and unique. They are advised to cram their weddings with 20 page lists/”must haves” to be incorporated. However, if you want what is known nationally as the “New York Style” wedding (simply, a great party) then the tried and true game plan is less is more. Use professional expertise to help limit your overall stress. Ultimately, you’re guests will remember a great party, not necessarily what they specifically ate or even what songs were played. Choose East Coast Music as your wedding reception band (or wedding ceremony and cocktail hour too!) to work WITH your caterer to make your day the best it can be. Choosing us also ensures that you can take an active role in creating a wedding music “playlist” that reflects your general taste and sense of style, but will still work in a party setting. Weddings, especially the fabled New York Wedding, are dance parties; and if what you are looking for is a dance band, we excel. Choosing pros ensures that you are relaxed enough to enjoy and remember your own party! Our great reviews on Wedding Wire, LI Weddings.com and the Knot/Wedding Channel are Unanimous: East Coast Music guarantees a great dance party! Check out any band you are considering performing at your all important day beforehand. If they make you want to get out of your seat and dance, then chances are it will do the same for your guests. 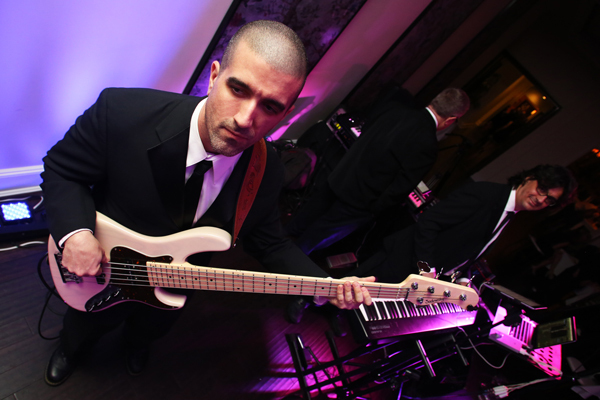 With multiple weekly performances and over 1000 successful weddings in our resume East Coast Music has become the top wedding band and the proven experts in combining client input in a way that it keeps all your guests involved in the non-stop dance floor action. Unlike other bands we do actually exist outside of lip synch karaoke tracks on a website and perform three to four nights a week. Click the link to our schedule and then come check us out!